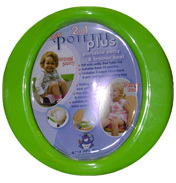 Potette Travel Potty and Trainer Seat - Full Size potty that folds flat. Suitable from 15 months. Includes 3 super-absorbent liners and hygienic carry bag. Folding trainer seat with handles. Non Slip, durable and comfortable. Suitable for all toilet seats.